This 9-day Leh-Manali-Delhi motorbiking adventure showcases the best of Ladakhi terrain, with high-rising mountains and hills dominating your views. You'll start off in the city of Leh, and ride over national highways and off-road pathways to visit secluded destinations in the cold deserts of Ladakh. Riding on Royal Enfield motorbikes, you'll be accompanied by a group of bikers from all over the country. As you explore the extreme landscape together, stay in tents under the star-studded night sky, battle the chilly weather and high-altitude roads, visit Buddhist monuments and monasteries, you'll make memories to last a lifetime. Please note that an additional refundable, security deposit of INR 10,000 per motorbike to be paid before the start of the Leh motorbiking trip. You'll start your Leh-Manali-Delhi motorbiking trip in Leh, and ride past the cold deserts of Nubra, and multi-coloured waters of Pangong Lake, the vast and sprawling More Plains, the camping grounds of Sarchu and the green mountain valleys of Manali. You'll thunder through some of the highest motorable passes and roads in the world, including the famous Khardung-La and Chang-La. En route, you'll be staying at clean, comfortable guesthouses or hotels, and camping on the banks of rivers, lakes, or in the laps of mountains. As you leave the rocky vistas of Leh and Ladakh behind, Manali welcomes you with pleasant greenery and fruit orchards in bloom. • Test your motorbiking mettle with this extreme road trip from Leh to Manali. • Ride through Khardung-La, one of the highest motorable passes in the world. • Camp beside stunning and gorgeous waters of Pangong Lake. • Explore the Ladakhi landscape on powerful Royal Enfield motorbikes. • Experience the culture of Leh, with a small group of your own friends. You're required to wear a helmet while riding the motorbike. For cancellations made 45 days or more before departure date of the Ladakh motorbiking trip: 75% refund. 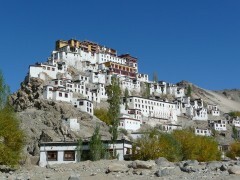 Today, you'll arrive in Leh, and check-in to your hotel. The day is free for you to acclimatize and get used to the altitude. You should get some rest, drink plenty of water, and go for short walks. If you need to buy any last minute essentials, today is a good day to visit the local marketplace. Overnight in a hotel at Leh. The first half of the day is reserved for you to test drive your motorbikes in the streets of Leh. Once you're comfortable with the motorbikes, you'll spend the day riding to a few of the landmarks in Leh city. 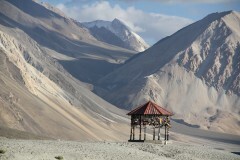 You'll visit Leh Palace, offering panoramic views of the mountains including Mt. 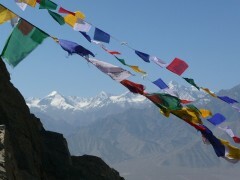 Stok Kangri, and the Shanti Stupa, a famous Buddhist monument with a hilltop statue of the Buddha. Later at night, you can explore the narrow streets of the Leh city and visit any shops, restaurants or other places of attraction. Overnight in a hotel at Leh. Take the national highway heading north from Leh and ride your motorbikes towards the Nubra valley. You'll ride through Khardung-La, the highest motorable road in the world, and into the cold deserts of the Nubra valley. With rolling sand dunes and scree slopes that stretch into the distance, it'll feel like you're the only ones in the world. Overnight in desert camps at Nubra valley. Turn your motorbikes around and ride to the multi-coloured Pangong Lake via the Chang-La pass, at an elevation of 17,590 feet. Spend some time by the lake with sweeping views of the barren, brown Ladakhi landscape. You'll stay in Swiss tents at a campsite besides the lake. as the sun sets, you can watch the lake changing colours between shades of blue and green. The night sky above the lake is heavily decorated by hundreds of twinkling stars. Overnight in tents at the Pangong Lake. You'll head out from Leh today, on your way to Sarchu, a major halt point for motorbikers travelling from Ladakh to Himachal Pradesh. En route, you'll ride through more high-altitude mountain passes like the Nakee-La, Lachulung-La and the Tanglang-La. You'll also ride through the More Plains, a rare plateau in Ladakh that is flanked by mountains on either side. It's a long drive today, so pace yourself and enjoy the views. Overnight in tents at Sarchu. After yesterday's long ride, buckle up for another stretch from Sarchu to Manali. As you inch closer to Manali, you'll notice the dramatic change in scenery, from desolate and high-rising mountains to green forested hills. You'll return your motorbikes in Manali, and celebrate the end of a successful trip. Overnight in tents at Manali. You can spend the day at leisure in Manali, but you'll have to check-out of the campsite in the morning. You can visit the Hadimba Temple, the famous Mall Road or any other place of attraction in Manali. In the evening, you'll board the bus to Delhi. Overnight in transit. The bus will reach Delhi by 10:00 hrs, subject to traffic conditions. Your trip ends here. Arrive at Leh. You'll be accommodated in a hotel at Leh. Today's meal package includes breakfast and dinner only. Take a rest day at Leh. You'll be accommodated in the same hotel at Leh. Today's meal package includes breakfast and dinner only. Overnight in desert camps at Nubra Valley. Ride from Leh to Nubra Valley. You'll be accommodated in desert camps at Nubra Valley. Today's meal package includes breakfast and dinner only. Overnight in tents at Pangong Lake. Ride from Nubra Valley to Pangong Lake. You'll be accommodated in Swiss tents at Pangong Lake. Today's meal package includes breakfast and dinner only. 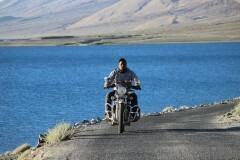 Ride from Pangong Lake to Leh. You'll be accommodated in a hotel at Leh. Today's meal package includes breakfast and dinner only. Overnight in tents at Sarchu. Ride from Leh to Sarchu. You'll be accommodated in tents at Sarchu. Today's meal package includes breakfast and dinner only. Overnight in tents at Manali. Ride from Sarchu to Manali. You'll be accommodated in tents at Manali. Today's meal package includes breakfast and dinner only. Board an AC Volvo bus from Delhi to Manali. You'll spend the night in the bus. Today's meal package includes breakfast only. Arrive at Delhi by 10:00 hrs, subject to traffic conditions. Your trip ends here. There is no pick-up for this Ladakh motorbiking trip. You'll begin the trip from the start point of Leh. 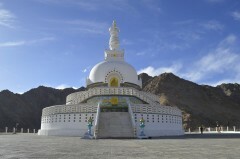 Leh is well-connected to most major cities via frequent flights to the city's Rimpochee Airport (IXL).